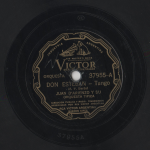 On the 3rd of July 1936 the Juan D’Arienzo orchestra recorded the tango Don Esteban. 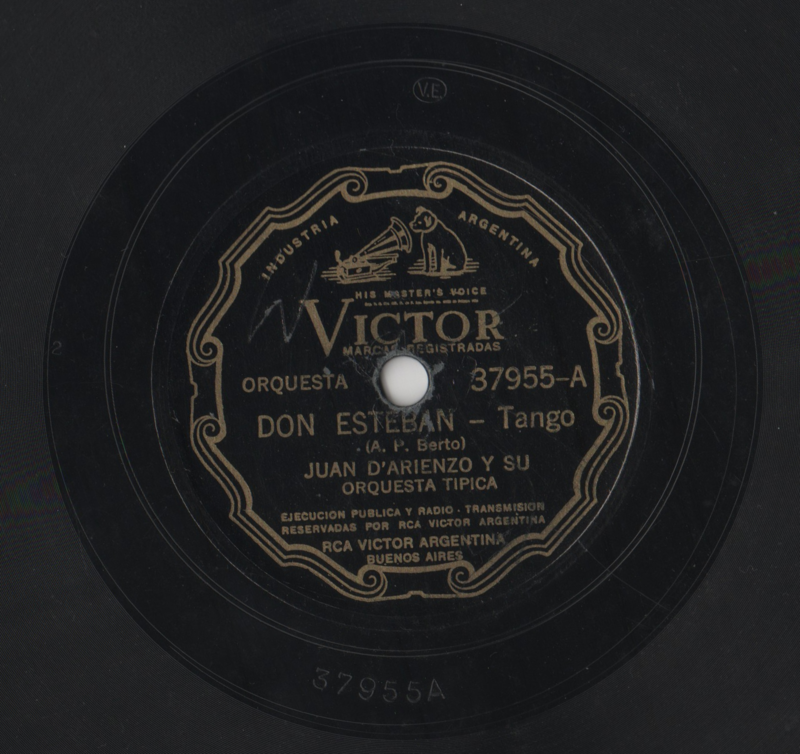 Most reeditions, especially from the RCA Víctor company, for which the tango has been recorded in 1936, contain a different version as the one which can be found on the japanese CD-collection CTA (Club Tango Argentino), Juan D’Arienzo Vol. 2 CTA-302. This has been an ongoing discussion in tango newsgroups and found to be quite mysterious. Take numbers can usually be found on Victor 78-rpm discs on the record surface area just outside the record label, in the nine o’clock position. First takes are usually not indicated; there is no number in that area when a record derives from take 1. 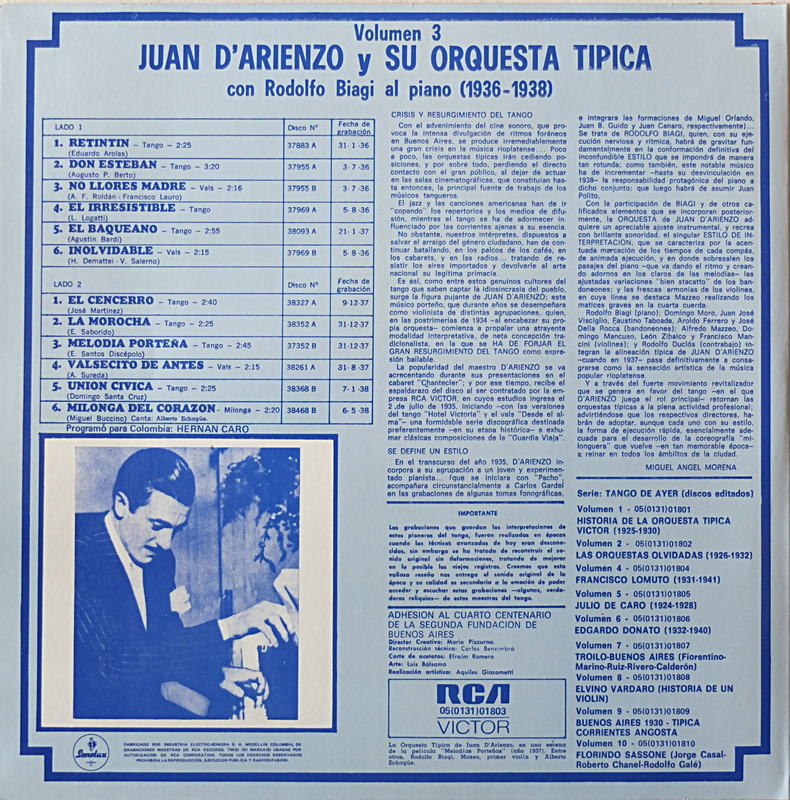 On the B-side of the record number 37955 is the vals No llores madre and to disambigue it has a little “1”, as for take one in the nine o’clock position right beside the label. To keep it short, the version by CTA is the second take, and my 78 rpm too. Now we can speculate what happened that day on the 3rd of July 1936. 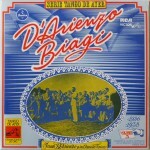 Maybe D’Arienzo was late and the orchestra recorded without him, possibly led by Biagi on the piano. The wax was already galvanised, when all of a sudden D’Arienzo rushed into the studio and ordered for a second take, lowering the part of Biagi as the two piano solos are now missing. By the way, in this scenario the jazzman would have been D’Arienzo. But most probably they were all present that day and just arrived at two different versions, maybe one more in the sense of Biagi and one more in D’Arienzo’s style. Then RCA Víctor said that they would send out both on the market and let the music lover decide which version they prefer. As D’Arienzo records sold like hot cakes, this seems to be the most plausible scenario 🙂 And it could be that take 1 has been intentionally released exclusively in Uruguay and that take 2 was intented for the domestic market. That would be an even more plausible explaination for the existence of the two Don Esteban versions (In this case the two piano solos could maybe be seen as a concession to what D’Arienzo thought would better meet the Uruguayan taste). Now, on the other side, it would be interesting to find an Argentinian 78 rpm containing the first take to contradict this theory. (From what I was able to check with other collectors so fare only take 2 exists from RCA Víctor Argentina). And also, as you might know the first take has been handed down by RCA Víctor exclusively with a very strong echo (reverb effect). 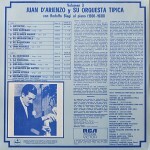 All CD versions, like from El Bandoneon and the Magenta version seem to be taken from that 1980 RCA Víctor LP. There is still no carefully restored version of this 1st take! 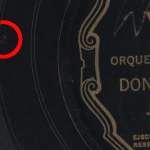 I’m also wondering why CTA did not mention the “2” for second take on their CD, though it’s really evident when you have the 78 rpm record in your hands. 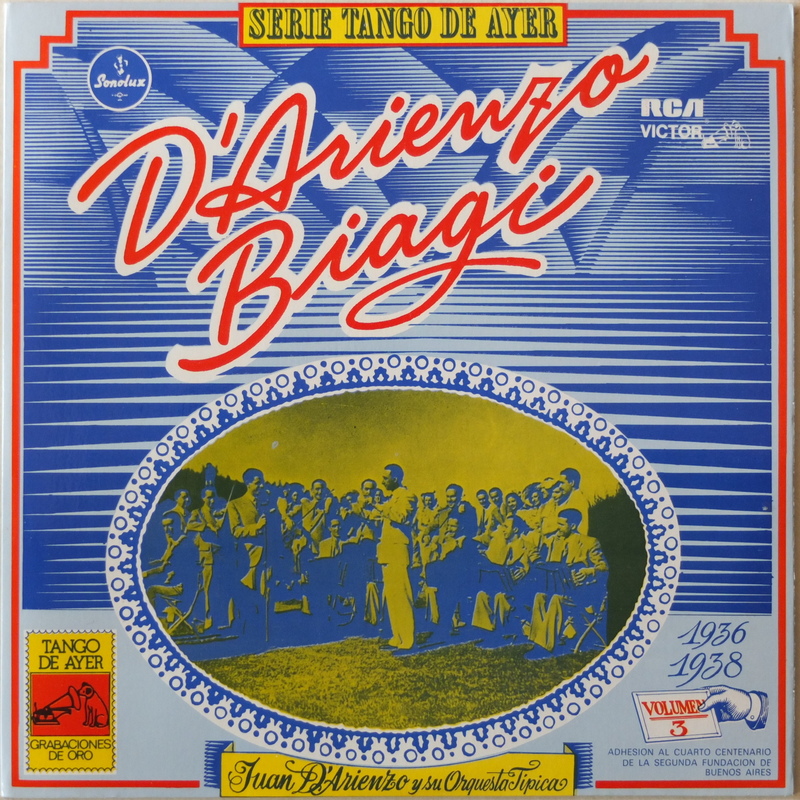 Check out the two versions, first the only reedition by RCA Víctor on the LP sampler Serie Tango De Ayer from 1980 (based on take 1) and then my restored version (based on take 2). Which one do you find jazzier? Very nice post! I love your speculative reconstruction of what happened on 3rd of July 1936. It somehow fits something that Horacio Godoy once told me: he mentioned that, according to people present during D’Arienzo studio rehearsals and recordings, his orchestra sounded very different when conducted by his assistant than when D’Arienzo himself took the lead. I assumed that this was because his presence and conducting inspired the musicians to play better, but maybe it was also because he introduced last-minute changes to the arrangement. Not all versions, Jens. The version from Blue Moon does not have that added reverb. I find it is fine for DJing. The much easier way to determine whether a recording is 1 or 2 is from the rhythm of the tune in bar 5, repeated in bar 7. Version 1 sounds as shown on the score here highlighted in magenta. Version 2 sounds as I have written below that, highlighted in blue. A very interesting post once again. 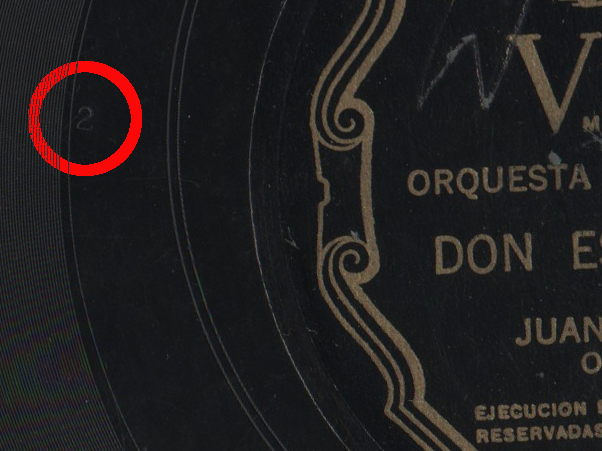 Do you know whether Odeón similarly indicated the take number on the record? Thanks for pointing us to the transfer on Blue Moon. I had assumed it would be the same as their earlier one on el bandoneón EBCD-43, which was an LP transfer, but it isn’t, and does sound like an SP transfer, although I wonder whether Blue Moon have added just a tiny bit of reverb themselves. I think you could be right. If you find a release with less reverb, please do say.